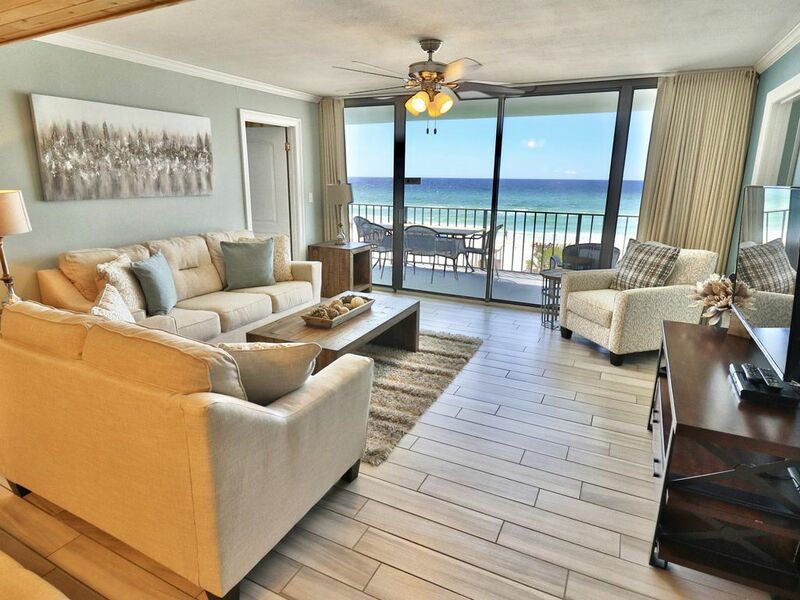 Dieses Layout ist eines der 3 Schlafzimmer in Panama City Beach mit 2 der Schlafzimmer am Meer. Das Wohnzimmer und alle Schlafzimmer verfügen über Flachbildfernseher mit Kabel-TV. Das 3. Schlafzimmer verfügt über 2 Queensize-Betten und einen Flachbildfernseher. Das Wohnzimmer verfügt über eine Queensize-Ausziehcouch. Great location right on beach and 15 to 20 minute drive to Pier Park. Very nice place however house keeping not cleaning well. Large air return in kitchen for AC has built up dirt on it and around handles on doors dirty for example.. Also, one outlet not coved and had exposed wires. We've never been to the beach when we had to deal with Red Tide ... well, now we have! It was nasty! Dead fish and coughing!!! Yuk! However, we made the best of it and was able to get in the ocean on our last day! Yay! Condo was in a great location, very clean. Our only complaint was that it really could use new mattresses. Also could have used better lighting in one bath. Only major complaint was not begin able to communicate with office staff. I left two messages and never heard back from them. After traveling late we arrived at 9:00pm when available check in was 4:00 to find our room hadn't been cleaned at all. Beds weren't made. Trash in room. Left over food. Dirty bathrooms. After calling room was ready at 11:30pm. Security guards were very unfriendly and enjoyed their feel of authority. We weren't treated as guest but treated more as a intruder. However staff in owners office extremely nice and helpful. The pictures online didn't do justice for how beautiful the condo was in person. serious problems with this unit! Condensation from Air conditioner unit leaks onto kitchen floor. Bath tub did not drain (called maintenance) did not fix problem... I pulled large amount of hair from this drain!! !All Bathroom sinks slow to drain... Hall closet has mold on ceiling. Cleaning staff is a joke... cleaning surface only.. My aunt fell in kitchen due to water in floor,from air conditioner... It's sad to know the owner tried to cover up this problem, by adding wood to the kitchen ceiling...The future of this owner is a law suit!!!! Can provide pictures! The location was great, the staff at Watercrest was nice. 307 was decorated beautifully and perfectly accommodated our 3 family group. However, we were delayed getting into the condo by 30 min. because of housekeeping. The two pass parking is not enough for 3 families, we rented the 3 bedroom and feel other arrangements should be made for a third vehicle. One family in our group had to park across the street and pay $50 for the week. The microwave was dirty, the dishwasher did not clean the dishes. Sliding glass door was extremely difficult to open. The air conditioner filters were fifthy. Unfortunately, this condo needs maintenance work.